Virginia Highlands is an eclectic community named for the intersection of Virginia and Highland Avenues. It is a walkable area that is popular with tourist due to its large number of sidewalk cafes, restaurants with patios, and lively spots to grab a cocktail. With plenty places to shop and relax, it is also popular with people looking to make Virginia Highlands their permanent home. Virginia Highlands was founded in 1812 as a farm built by William Zachary. During the late 1800s, the Nine Mile Circle streetcar arrived to Atlanta and enabled residents to develop the Virginia Highlands area due to the new accessability. It remained an affluent, upper-middle class region until the 1960s but then underwent a gentrification in the 1990s. By the early 2000s, it was an incredibly desirable neighbor to live in and is still occupied by local art galleries, neighborhood businesses, and eclectic retailers. 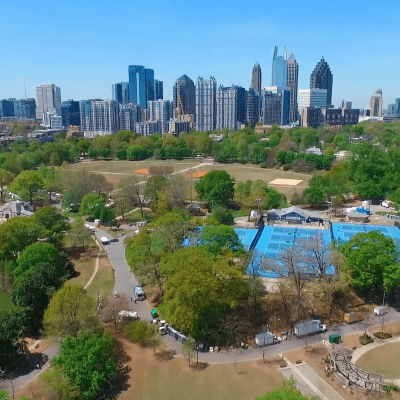 Piedmont Park is a 185-acre park in the center of Atlanta with gorgeous skyline views and just about everything an outdoor lover could ask for; gazebos, lakes, green space, tennis courts, pools, a splash pad, picnic spaces, fountain, playground, dog park, and formal event venues. Piedmont Park is a frequent venue for outdoor music concerts and community festivals, making it a hot spot for locals and guests year-round.